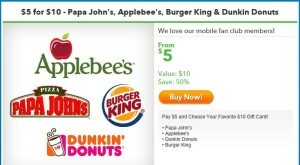 Saveology has a great offer for those of us who like Papa John’s, Burger King, Dunkin’ Donuts, or Applebee’s. You can get a $10 Gift Card for just $5. You can purchase up to 3 gift cards. This entry was posted in Deals by mlemon317. Bookmark the permalink.